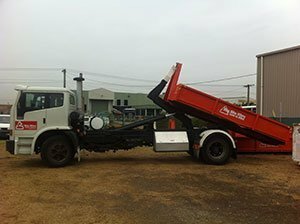 If you are looking for Skip Hire in Melbourne you have come to the right place. Skip hire Melbourne is our specialty. We provide skip bin hire throughout Melbourne to commercial and domestic customers. You will find our skip bins on many Melbourne streets being filled with anything from demolition and construction waste to household and domestic rubbish. Big Bin Hire has a large client base because we care about our customers. Our team is friendly and reliable and we work hard making sure our skip bin prices are very competitive. There are plenty of Skip bin hire companies in Melbourne to choose from, but you need someone you can rely on that is going to deliver your skip bin on time, in a professional and safe manner. If you are keen to know our skip bin hire costs, please call us on 1300 22 44 73. We don’t provide our skip bin hire prices on our website, because every case is different. We want to work with you to save you money on your skip bin hire. Read our latest blog post on how you can save money on skip bin hire. Advise the Big Bin Hire team if you have 100% loads of green waste, timber, concrete, household items and so on, as this will save our recycling time and you money. Consider the various skip bin sizes and decide whether you could actually benefit from a larger skip bin, or whether you can hire a smaller skip bin and dispose of your remaining waste in a different manner..
For a better understanding read more on our skip bin sizes. Remember, all of Big Bin Hire’s skip bins are walk-in skip bins. This makes it easy for you to load your skip bin. Our skip bins range from 4-20m3 so we have a skip bin size to meet most needs. Remember there are loading terms and conditions that you must abide when hiring a skip bin from Big Bin Hire. Skip bin hire Melbourne – Providing hook lift walk-in bins for easy access. Here is the general radius of our skip delivery areas. But again, please call us to discuss your skip bin requirements. Big Bin Hire services most of Melbourne with skip bin hire.